I'm posting this very interesting piece about Yemen on the New York Times newspaper where Sheik Hamid al-Ahmar, one of Yemen's leading politicians and an important member of the Islamist conservative political party, al-Islah party was quoted. He was quoted mocking change square in Sana'a as a place where Yemeni women/activists would hang out with their boyfriends like it was a disco! I'm posting the piece here because I assume it will be deleted soon from their website after al-Ahmar officially denied on his facebook page that he talked so; accusing the New York Times and Swedish research, Eva Sohlman of fabricating his statement. His statement in the piece is regarded as a very offensive remark against female protesters in Yemen. Hence, all reactions were denouncing his statement. Therefore, he backed away from his remark and blamed the newspaper of quoting him wrongly. Nevertheless, a group of activists in Yemen are discussing about suing Hamid al-Ahmar for his interview with the newspaper. I keep tweeting the newspaper about that and i got no reply. In the coming days, we would surly know what would the newspaper say about that..it'll be interesting to find out who was lying! SANA, YEMEN — A year ago hundreds of thousands of people flocked to Sana’s Change Square and turned it into the symbolic heart of the revolution by calling from their tents for the resignation of President Ali Abdullah Saleh and euphorically debating the future of Yemen. Today, six months after Mr. Saleh stepped down, a head-high wooden wall has been raised to separate the women from the men and more than a thousand people remain in the square, waiting for the fulfillment of a revolution stalled by the former president’s lingering influence and internal divisions. “The revolution is not finished yet. Saleh may have resigned, but the old regime still clings on to power,” said Fuad al-Himyari, the young, mild-mannered leader of the opposition movement’s umbrella organization, the Higher Youth Coordination Committee, during an interview in the tent city. But this process has proven more challenging than expected and has led to great tensions in the capital. In the last month, President Abdu Rabbu Mansour Hadi started the process of replacing some of Mr. Saleh’s relatives and loyalists from the military while Mr. Saleh tried, but failed, to stop him every step of the way. The most critical moment came when Mr. Saleh’s half-brother, General Mohammed Saleh al-Ahmar, commander of the air force, refused to step down and briefly took over Sana International Airport. The country is bracing for Mr. Hadi’s next move. “There is a serious conflict between the old and the new presidents. The situation is very tense. We are not on the other side of this yet,” said Jamal Benomar, the U.N. envoy to Yemen, during a visit to the country last month. The situation is further complicated by an old triangle of rivalry that sparked the fighting last summer between Mr. Saleh, the powerful tribal Ahmar family, and Major General Ali Mohsin al-Ahmar, a powerful military commander who is unrelated to the Ahmar tribe and who has since defected to the opposition. Some militias, checkpoints and roadblocks remain scattered across the capital. People wonder anxiously if the resounding gunfire in the evenings is caused by weddings or fighting. Sana also suffers daily power cuts because of anti-revolutionary sabotage so that generators buzz constantly in shops, offices and homes. Dinner is sometimes served in complete darkness as the latest developments of the Yemeni political drama are discussed. Those close to Mr. Saleh describe him as a man locked in the delusion that the country cannot manage without him. The bomb attack on the presidential palace last summer did not only cause him long-lasting and painful wounds, but has also led to mild dementia, these sources say. Last week, the United States warned supporters of Mr. Saleh that it might freeze their assets if they blocked the transfer of power. It was a move intended to end the power struggle and bolster Mr. Hadi, who has made a strong commitment to fight groups linked to Al Qaeda, whose influence expanded during last year’s political chaos. The fight with the Qaeda militants, which has intensified in the last couple of weeks, further detracts from the country’s democratic transition. On Monday, Al Qaeda claimed responsibility for a suicide bombing in the heart of Sana that killed more than 100 soldiers and wounded several hundred. Meanwhile, the delayed transition has exposed deep divisions within the opposition youth movement. In Change Square alone, there are more than 300 groups represented — from independents, women’s rights activists, Socialists, Houthi rebels from the north, secessionists from the south, to Al Islah and different tribes — many divided along old political and sectarian fault lines. “It is very difficult to gather and coordinate and create a platform for all these different groups and clans,” said Mr. Himyari. The most visible divide in the square is the one between the independent women and the conservatives of Al Islah. 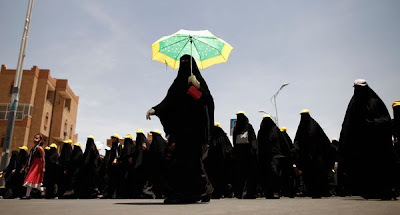 At stake are the future rights of Yemen’s women — and the revolution’s democratic outcome. In the early days of the revolution, women played a key role and took an unprecedented place in Yemeni history. They delivered blankets, cooked food and cared for the wounded. Soon they were found at the front lines, side by side with the men, and led protests, slept in the squares, and reported as bloggers and journalists. Tawwakol Karman, the human rights activist and Nobel Peace Prize laureate, shed her veil to address the crowds and became the women’s most famous face. Now many fear a backlash. Well-organized, Al Islah has taken the lead, while the women have had difficulty coordinating their views. During the first post-revolution women’s conference in March some started throwing shoes at each other after a political argument. In Change Square, where Al Islah has taken control, women described psychological and social pressure to go back to their homes. After a wooden wall was raised to separate men and women under the pretext of allowing women more privacy, women have become conspicuously scarce, with about 5 to 10 women loitering around the area during daytime, fully swathed in black. Sheik Hamid al-Ahmar, a member of Al Islah’s political leadership, played down the women’s concerns and explained that the party, which represents moderate to extremely conservative Islamic forces, had changed and become more open. This picture was challenged by many in the square who are afraid that Al Islah’s rise might lead to the oppression of human and women’s rights in an upcoming national dialogue on a new constitution and a new social contract. At such a critical time for the movement, there were hopes that Ms. Karman would play a unifying role. But the normally vociferous activist has been silent. She rejected a request from women’s rights activists to help strengthen their voice ahead of the dialogue, said Enas al-Arashi, a political analyst, saying that was possibly because it could cause problems for her within her party, Al Islah. “Tawwakol should do something for the women now. She could at least write an op-ed!” said an activist in the square, who declined to give her name because of the sensitivity of the matter.